Each year, millions of tourists visit Katoomba, a city one hour’s drive west of Sydney, Australia’s biggest city. There they enjoy the spectacular Three Sisters. These ‘ladies’ are not a group of performers, but a huge rock outcrop. Set in a World Heritage Area of the Blue Mountains, the Sisters are now something of an Australian icon. Near the lookout at Echo Point, the Sisters watch over an impressive valley. On a clear day, Kings Tableland looms in the distance (see panorama, left). Throughout the day, the vista alters as the changing sunlight transforms the magnificent colours of the Three Sisters. At night, their floodlit shape looks stunning against the blackness of the night sky. 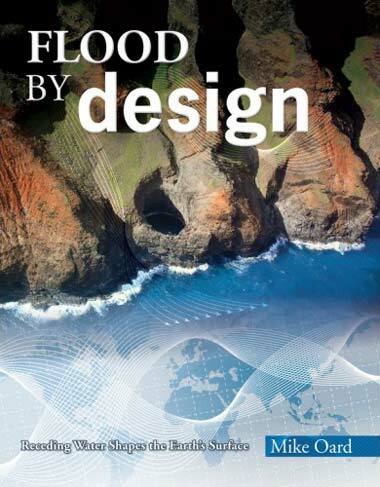 Most visitors don’t realize they are looking at compelling evidence for the global Flood described in the Bible. 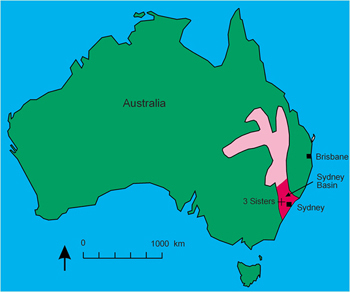 Figure 1: Many geologists consider the Sydney Basin (pink) is connected to large, long sedimentary basins (lighter pink) to the north. This sedimentary network is over 2,000 km (1,200 miles) long and contains rich deposits of coal and gas, the products of buried vegetation. Overlaying sediments have been omitted from the figure. The sandstone, of which the Sisters are made, points to huge watery deposition. The valleys and gorges, shaped when the Sisters were carved, are evidence of immense watery erosion. The Biblical global Flood explains this deposition and erosion. Let’s look a bit closer. It’s not difficult to appreciate that the sandstone covers an immense area. From the lookout, we can see that the same rocks form steep cliffs all around the gorge. Before the magnificent valley was eroded, the sandstone strata covered a large area. But the strata extend much further than we can see from the lookout. From Katoomba they reach 160 km (100 miles) south, 160 km north, and 160 km to the east—an immense rectangular deposit of sediment (see Figure 1).1 Geologists call it the Sydney Basin, the resting place for massive volumes of sediment eroded from the Lachlan Fold Belt to the west, and the New England Fold Belt to the east. 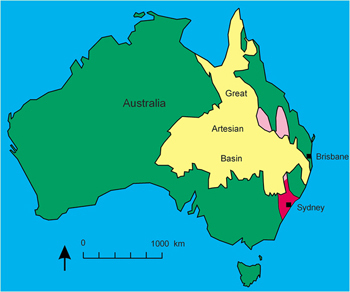 Many geologists consider the Sydney Basin is the southern end of a 250-km (160-mile) wide system extending 2,000 km (1,200 miles) north (Figure 2).2 The immense size of the deposit is evidence for catastrophe—but there’s more. We see that the sand in the Three Sisters is deposited in layers. The road cuttings in the area give a better view, or we can examine the overlying Hawkesbury Sandstone that forms steep cliffs around Sydney (Figure 4). Joining the prominent, horizontal layers is a faint, inclined layering called ‘cross bedding.’ This indicates that the sand was deposited by flowing water. Figure 2: Later, kilometre–thick deposits of sediment and vegetation were dumped on top, concealing the connection between the Sydney Basin and the northern basins. The later–deposited sediments contain abundant water resources in what is called the Great Artesian Basin. From the size of the cross beds, geologist Dr Patrick Conaghan, Senior Lecturer at the School of Earth Sciences at Macquarie University, determined the conditions under which the sand was deposited. In 1994 he described a wall of water up to 20 m (65 feet) high and 250 km (150 miles) wide coming down from the north at enormous speed.4 This catastrophic interpretation is consistent with what we would expect during the Biblical Flood. The sandstone formations are very thick, ranging from 100 m (330 ft) to 200 m (660 ft) or more.1 To accumulate such thick deposits of sand, the water level in the Sydney Basin must have risen continuously. Otherwise, the sand would have been carried through the area to deeper water. Yet, in the thick sandstone formations, there are no indications of extended time breaks between deposition (e.g. inhabited horizons containing preserved fossil communities). Deposition from the fast-flowing water was continuous in an ever-deepening basin. Figure 3: A vertically-exaggerated east–west cross section of these later sediments, which were the last sediments deposited as the floodwaters were rising on the Earth. The evidence therefore points to huge volumes of sediment being eroded from the continent and carried in a ‘river’ hundreds of kilometres wide and thousands of kilometres long. No river on the face of the Earth today is anywhere near this large. This ‘river’ sorted the sediment into its different sizes, which is why so much sand was deposited in the same place. Well after the sediments of the Sydney Basin were deposited, in the second part of the Flood the offshore ocean floor began to sink and the Blue Mountains began to rise. The water then covering Australia began to run off the continent. As it did, it rapidly cut the landscapes. At first the water flowed in sheets, shaving flat vast areas of the continent sometimes producing ‘planation’ surfaces. Then, as the flow reduced, the water cut wide valleys like those we see around the Sydney area. As the volume of water continued to decrease, narrower valleys were cut at the edges of plateaus, like those we see from the Three Sisters lookout (Echo Point). When the water had completely receded and the land was dry, large valleys remained where the flow had been. These valleys end abruptly in blind, steep walls. 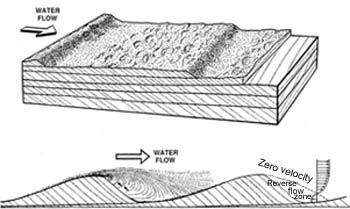 We see waterfalls today at the ends of these valleys, but they are only tiny remnants compared with the flow of water that eroded the valleys (Figure 5). There is no way that such minuscule water flows could have carved the huge valleys. This pattern of erosion is exactly what we would expect during the final phase of the global Flood. One reason people don’t connect the Three Sisters with Noah’s Flood is that the rocks are supposed to be about 230 million years old. At this age they obviously could not have formed in a flood 4,500 years ago. However, there is a problem with the way rocks are dated. Basically, long-age geologists get the dates wrong because they make wrong assumptions about the past. In particular, they ignore the catastrophic effects of Noah’s Flood. Long-age geologists assume that sedimentary rocks were deposited slowly, e.g. by rivers like those we see on Earth today. With so much sedimentary rock, they imagine that it took millions of years. But catastrophic conditions during Noah’s Flood would have deposited lots of sediment quickly and eliminated the need for millions of years. Evidence of such catastrophic deposition, as we have seen, is preserved in the rocks themselves. For these rocks, long-age geologists have assigned an age of around 230 million years based on their fossil content and their relative position in the sequence of rock layers in the region. Recently, a creationist geologist measured the carbon-14 content of a piece of wood found in a quarry in the overlying Hawkesbury Sandstone.7 Long-age geologists wouldn’t bother analyzing for carbon-14 because they believe the rock is 230 million years old. All carbon-14 should have disappeared by 50,000 years, at the most. There should be no carbon-14 left. However, the analysis confirmed a small but significant amount of carbon-14 in the wood—clear evidence that the sandstone is less than 50,000 years old. The small level of carbon-14 does not reflect an age, but rather the low concentration of carbon-14 in the atmosphere before the Flood (carbon-14 has been building up since the Flood). The Three Sisters are an Australian tourist icon. They are also evidence of Noah’s Flood. These sandstone monuments display evidence of large-scale catastrophic deposition and immense watery erosion. That is exactly what we would expect from Noah’s Flood. 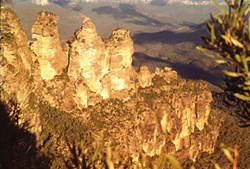 Not only are the Three Sisters an icon of Australia, they are also an icon of the reliability of the Bible. Broken tree trunks deposited vertically in thickly bedded sandstone 40 km (25 miles) north of Sydney, overlooking the South Pacific Ocean. Located on the eastern side of ‘Box Head’ in Bouddi National Park, the head forms the northern entrance to the Hawkesbury River. This sandstone is part of the Gosford Formation. Lying under the Hawkesbury Sandstone, it is approximately equivalent to the formation comprising the Three Sisters, over 100 km (60 miles) west. Excellent cross bedding is obvious in the layers above the logs. The blocky appearance of the deposit and the cross bedding point to deposition from deep, fast-flowing water. The thickness of the deposit indicates that the water was continually deepening as the sand was being deposited. These logs did not grow here but were washed into place. The trunks are broken with no sign of soil or roots. They testify to the violent forces which uprooted and smashed an ancient forest, sorting roots and trunks from leaves and branches. The leaves and branches were deposited in other strata of the Sydney Basin. They form the coal measures that are now mined for power generation. Update 15 September 2008: Since writing this report I have been able to inspect close up these vertical objects at Box Head and discuss their identification with others. I described them here as being vertical logs but on closer inspection in the field they seem instead to be unusual iron concretions. There are numerous other vertical concretions of various shapes in the sandstone in that area. Even as iron concretions these objects are unusual in their shape and orientation. 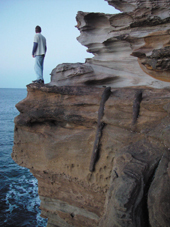 Although these particular objects do not now appear to be tree trunks, it does not alter the fact that these sandstone deposits comprising the cliffs and the wave platform were deposited very quickly over a huge area pointing to the fact that the Sydney basin was formed by a large watery catastrophe, consistent with Noah’s Flood. Hawkesbury Sandstone deposited from a wall of water? Jones, D.C. and Clark, N.R. (Eds. ), Geology of the Penrith 1:100,000 Sheet 9030, New South Wales Geological Survey, Sydney, 1991. Return to text. Allen, D., Sediment transport and the Genesis Flood—Case studies including the Hawkesbury Sandstone, Sydney, J. Creation 10(3):358–378, 1996. Return to text. Austin, S.A. (Ed. ), Grand Canyon: Monument to Catastrophe, Institute for Creation Research, California, pp. 33–35, 1994. Return to text. Woodford, J., Rock doctor catches up with our prehistoric surf, The Sydney Morning Herald 30 April, 1994, p. 2. For more detail, see: Conaghan, P.J., The Hawkesbury Sandstone: gross characteristics and depositional environment, Bulletin, Geological Survey of New South Wales 26:188–253, 1980. Return to text. Walker, T.B., A Biblical geologic model, In: Walsh, R.E. (Ed. 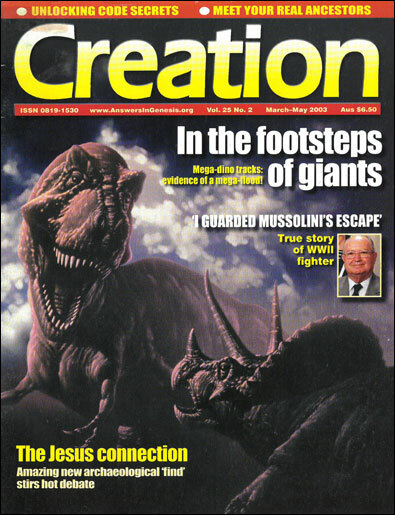 ), Proceedings of The Third International Conference on Creationism, Creation Science Fellowship, Pittsburgh, pp. 581–592, 1994. Return to text. Info Blue Mountains History Plaza, info.mountains.net.au, 29 November 2002. Return to text. Snelling, A.A., Dating dilemma: fossil wood in ‘ancient’ sandstone, Creation 21(3):39–41, 1999. Return to text.